Vanguard Charitable is celebrating its 20th year of operation. For me, as the chief financial officer, part of what this means is that we now have 20 years’ worth of market data to consider. We can look at how charitable investments made in our very first year would have performed in the intervening time and use real-life evidence to examine our 'save to give' mantra, our belief that long-term, strategic philanthropy is the most effective way to make a difference. In a three-part blog series, I will explore hypothetical giving scenarios to consider an important question: How have Vanguard Charitable donors fared these past 20 years? How have they met or exceeded their goals? In examining these scenarios, I hope not only to reveal trends in past performance, but also to shed light on the strategies our donors can use as we move into our next 20 years. So let’s assume that the year is 1997. A hypothetical donor named Jessica is 10 years away from her target retirement date of 2007, and she realizes just how important it is to her that she continue to support a collection of charities that provide services to military veterans. She does not anticipate being able to contribute additional funds to charity after she retires, but she believes she has the ability to donate in the next 10 years, as she continues to draw a salary. After considering giving the money directly to charity, Jessica instead decides that she will open a Vanguard Charitable account and contribute $25,000 each year while she is still working, and that she will grant out 7.5% of her year-end balance so that she can continue to give on an annual basis. She will then take the first 10 years of her retirement, from 2007 to 2017, to draw down the remainder of her Vanguard Charitable account. She tailors her investment strategy accordingly: She selects an aggressive allocation for the first 10 years, consisting of mostly equities. Upon retirement, she switches over to a more conservative portfolio, investing primarily in bonds. Jessica’s results are encouraging, and she has given us a useful model to consider. 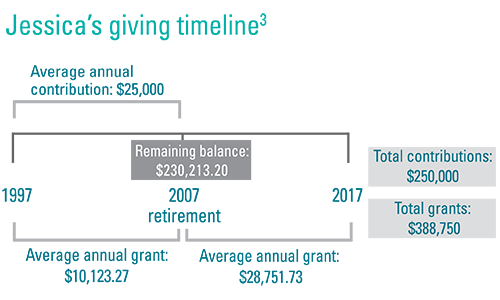 Her use of a donor-advised fund, along with her strategic investment strategy and targeted time horizon, has increased her charitable impact by 56% compared to issuing her annual contributions directly to charity up until retirement. More significantly, Jessica has continued her philanthropy through retirement, lengthening the duration of her support from 10 to 20 years. We know that charities rely on this kind of consistent support, which offers them the security to develop long-term plans and service goals. It is true that many post-retirement individuals can help charities by naming them as beneficiaries in their wills, but as Jessica demonstrates, charities can also benefit by not having to wait for a donor’s death. Planning for your philanthropy retirement ahead of time can ensure your continual support for the causes you care about when you no longer have a working income to support your charitable endeavors. Want more save to give? Read the second and third blogs in this series. All investments are subject to risk. Past performance does not guarantee future returns. Diversification does not ensure growth or protect against a loss in a declining market. All contributions are made as charitable donations to a philanthropic account held at Vanguard Charitable’s donor-advised fund. No startup costs are incurred, but accounts are charged an annual administrative fee based on balance: 0.60% for the first $500,000 and 0.40% for the remaining balance. Pricing will continue to decrease as account balance increases. All account assets are invested in a mix of underlying Vanguard® mutual funds, which assess an expense ratio. Expense ratios are assessed by the underlying funds and may vary based on account allocation and status; Vanguard Charitable does not itself charge investment fees. Many donors contribute to a DAF at year-end and then start recommending grants in the following year. To represent a standard accrual time in the scenarios, contributions are counted on January 1 and grants are issued on December 31 of the respective year. Invested assets are rebalanced monthly to match recommended allocations. The allocations in the paper are suggestions, and donors are encouraged to diversify their investment recommendations to take advantage of a broad range of investment options, including international and domestic and across major asset classes. 2Actual average return is calculated as a time-weighted return annualized over a 20-year period. 3Net performance is based on actual returns of the Investor share class of Vanguard Total Stock Market Index and Vanguard Total Bond Market Index Funds from January 1997 through December 2016. Performance returns reflect market movement, reinvestment of dividends/interest and capital gains, and deduction of the underlying fund’s expenses. Vanguard Total Stock Market Index Fund benchmark: Spliced Total Stock Market Index reflects the performance of the Dow Jones U.S. Total Stock Market Index (formerly known as the Dow Jones Wilshire 5000 Index) through April 22, 2005; MSCI US Broad Market Index through June 2, 2013; and CRSP US Total Market Index thereafter. Vanguard Total Bond Market Index Fund benchmark: Spliced Barclays U.S. Aggregate Float Adjusted Index reflects the performance of the Barclays U.S. Aggregate Bond Index through December 31, 2009, and Barclays U.S. Aggregate Float Adjusted Index thereafter.